Queen Mary (b 1516; 1553–1558) turned her attention at age 37 to finding a husband and producing an heir, to block her sister the Protestant Elizabeth from succeeding to the throne who was still her successor under the terms of Henry VIII’s will and the Act of Succession of 1544. While there were potential English suitors, it was suggested that she marry the heir to the Spanish Crown, Prince Philip of Spain. There was some who feared that England would be relegated to a dependency of the Habsburgs if such a marriage took place and this made it very unpopular with the English in general. The Protestants were fearful of Catholicism taking hold from Spain. Civil unrest broke out when Mary insisted on marrying Philip. The Protestants wanted to depose Mary in favor of Elizabeth, that became known as the Wyatt’s rebellion, which also involved the Duke of Suffolk, the father of Lady Jane Dudley or The Nine Days’ Queen, was an English noblewoman and de facto monarch of England from 10 July until 19 July 1553. She relinquished the crown and was subsequently executed. Lady Jane was the great-granddaughter of Henry VII through his younger daughter Mary She was a first cousin once removed of Edward VI. In May 1553 Lady Jane was married to Lord Guildford Dudley, a younger son of Edward’s chief minister, John Dudley, Duke of Northumberland. 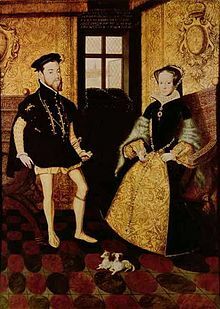 When the 15-year-old King Edward VI was dying in June 1553, he nominated Jane as successor to the Crown in his will, thus subverting the claims of his half-sisters Mary and Elizabeth under the Third Succession Act. Jane was imprisoned in the Tower of London when the Privy Council decided to change sides and proclaim Mary as queen on July 19, 1553. Jane was then convicted of high treason in November 1553, which carried a sentence of death, though her life was initially spared. So Mary‘s coming to the throne was certainly not routine. 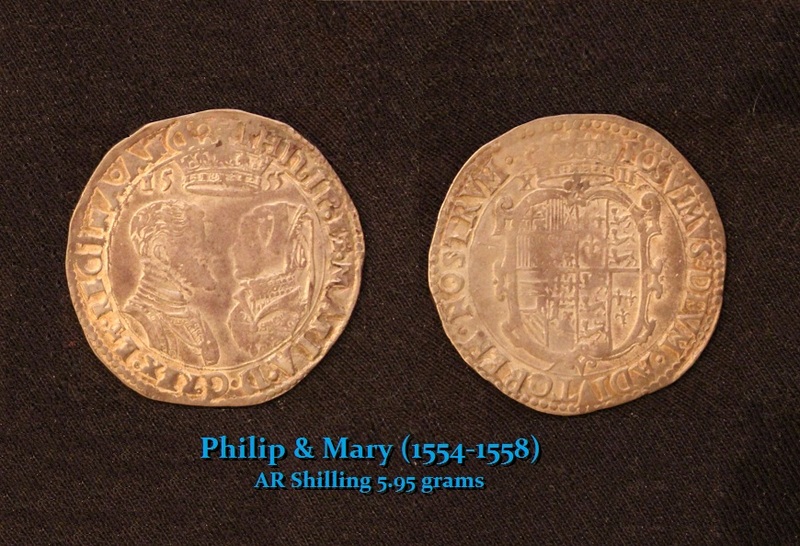 Mary declared publicly that she would summon Parliament to discuss her marriage to Philip, stating that should Parliament decide that the marriage was not to the advantage of the kingdom, she would refrain from pursuing the union. On reaching London, the Wyatt Rebellion was defeated resulting in the execution of Wyatt, Duke of Suffolk, and his daughter Lady Jane with he husband. 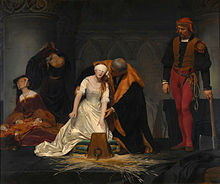 Elizabeth, though protesting her innocence in the Wyatt affair, was imprisoned in the Tower of London for two months, and then was put under house arrest at Woodstock Palace until Mary‘s death. Under the English common law doctrine of jure uxoris, the property and titles belonging to a woman became her husband’s upon marriage, and it was feared that any man Mary married would thereby become King of England. Mary‘s grandparents, were in fact Ferdinand and Isabella of Spain. Under the terms of Queen Mary’s Marriage Act, Philip was to be styled “King of England”, and all official documents that included Acts of Parliament were to be dated with both their names. England would not be obliged to provide military support to Philip’s father in any war. But the key was that Philip could not act without his wife’s consent or appoint foreigners to any office in England. Philip sought the marriage for its political and strategic gains and was not happy with the terms. It was a political marriage to preserve the holdings of the Spanish Low Countries (Netherlands). Upon Mary‘s death, the Crown passed to the Protestant Elizabeth, not Philip.